Researchers from Keele University have worked with an international team of astronomers to find for the first time that a white dwarf and a brown dwarf collided in a ‘blaze of glory’ that was witnessed on Earth in 1670. The research is published in the journal Monthly Notices of the Royal Astronomical Society. In July of 1670, observers on Earth witnessed a ‘new star’, or nova, in the constellation Cygnus - the Swan. Where previously there was no obvious star, there abruptly appeared a star as bright as those in the Plough, that gradually faded, reappeared, and finally disappeared from view. Modern astronomers studying the remains of this cosmic event initially thought it was triggered by the merging of two main-sequence stars – stars on the same evolutionary path as our Sun. This so-called ‘new star’ was long referred to as ‘Nova Vulpeculae 1670’, and later became known as CK Vulpeculae. However, we now know that CK Vulpeculae was not what we would today describe as a ‘nova’, but is in fact the merger of two stars - a white dwarf and a brown dwarf. 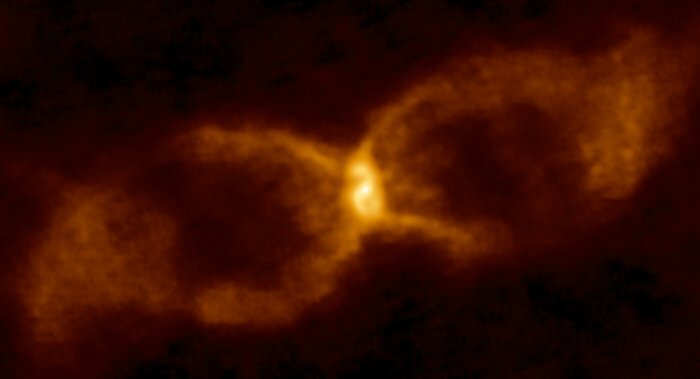 By studying the debris from this explosion - which takes the form of dual rings of dust and gas, resembling an hourglass with a compact central object - the research team concluded that a brown dwarf, a so-called failed star without the mass to sustain nuclear fusion, had merged with a white dwarf. The team of European, American and South African astronomers used the Atacama Large Millimeter/submillimeter Array to examine the remains of the merger, with some interesting findings. By studying the light from two, more distant, stars as they shine through the dusty remains of the merger, the researchers were able to detect the tell-tale signature of the element lithium, which is easily destroyed in stellar interiors. “Stellar collisions are the most violent events in the Universe. Most attention is given to collisions between neutrons stars, between two white dwarfs – which can give a supernova – and star-planet collisions. “The white dwarf would have been about 10 times more massive than the brown dwarf, so as the brown dwarf spiralled into the white dwarf it would have been ripped apart by the intense tidal forces exerted by the white dwarf. When these two objects collided, they spilled out a cocktail of molecules and unusual element isotopes. “These organic molecules, which we could not only detect with ALMA, but also measure how they were expanding into the surrounding environment, provide compelling evidence of the true origin of this blast. This is the first time such an event has been conclusively identified. Since most star systems in the Milky Way are binary, stellar collisions are not that rare, the astronomers note. During the twentieth century, astronomers came to understand that most novae could be explained by the runaway explosive behaviour and interactions between two close stars in a binary system. The features seen around CK Vulpeculae didn’t seem to fit this model particularly well, however, puzzling astronomers for many years. The new work appears in: “ALMA reveals the aftermath of a white dwarf–brown dwarf merger in CK Vulpeculae”, S.P.S. Eyres, A. Evans, A. Zijlstra, et al., Monthly Notices of the Royal Astronomical Society (2018), in press (DOI: 10.1093/mnras/sty2554).